Porcelain veneers have been available since the 1980s and have revolutionised cosmetic dentistry. However, it is really only in the last 5yrs or so that they have caught the public’s imagination with the advent of “make-over” television programmes. Since we first placed our first porcelain veneers in the 1980s we have now provided over a thousand veneers, and these have changed the appearance of many hundreds of our clients. Well designed and fitted veneers look natural and are modern porcelains are very strong. 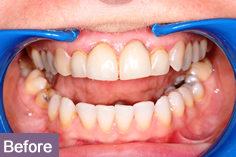 They can be used to change the shape of teeth, close spaces, hide old fillings and discoloured teeth. They may sound fantastic and they are but they are not suitable for everybody. We will discuss whether they are right for you at your consultation visit. Please have a look through the gallery to see what veneers can be used for. Veneers are made of a very thin layer of porcelain (usually 0.5-1mm thick) which is custom made in a dental laboratory to fit each individual tooth. Some people compare them to a false fingernail for your fingers, but obviously a lot more technically advanced! The colour and the shape of the porcelain is decided by yourself and the dentist at the treatment planning stage. How are Veneers fitted to my teeth? Preparation – This is the longer of the 2 appointments during which the dentist re-contours the “front” or visible part of the tooth to allow room for the veneer to be placed. The preparation of each tooth is usually minimal and should not compromise the long term health of the tooth. Impressions of the teeth are taken and sent to the laboratory where the veneers are custom made. Temporary veneers are then placed by your dentist. Once the temporary veneers have been placed on your teeth this is where the cosmetic artistry begins, the shape of the temporary veneers is decided by the shapes we make for your “trial smile” on models of your teeth. We then very carefully refine the shapes on your teeth and only when you are completely satisfied with the size and shape do we proceed to the next stage which is actually making the veneers. Cementation – Usually this appointment is about 1 week after the preparation. Here the dentist places the veneers on the teeth and checks the fit and appearance. If you and the dentist are both happy with the outcome then each veneer is bonded very strongly to the corresponding tooth. The bond will be at about 90% strength when you leave the surgery, and within hours they will be at full strength. You will leave with your smile transformed! This is always the most difficult question to answer as it mostly depends upon how well you look after them. We have patients who have had veneers on for approaching twenty years. If well maintained then you should expect a veneer to last 10-15 years, after which time they may need replacing due to normal wear and tear. In essence almost any tooth can be veneered, but it is not normally advisable to place veneers on heavily restored, worn or very discoloured teeth. Crowns are the option of choice for these teeth. 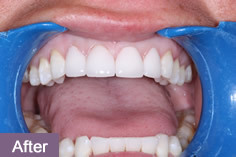 Veneers are usually placed on those teeth which can be seen when you smile – i.e. your upper front teeth. For the best cosmetic results veneers are normally placed symmetrically in pairs of 2, 4 or 6 teeth. Porcelain veneers can be used to straighten teeth, but normally only if the teeth are slightly crowded or out of place. If the crowding is more severe then crowns or braces are often a more suitable choice. Veneers are also totally unsuited if your front teeth overlap more than normal. If you only want to change the colour of your teeth and they don’t have many fillings then Tooth Whitening should be considered. Crowns are also an alternative, which can be more appropriate if you have heavily filled or worn teeth to start with. See “Crowns” for further information on these. Bonding is another option which involves the addition of tooth coloured filling material to the teeth. This is only suitable for minor corrections though. 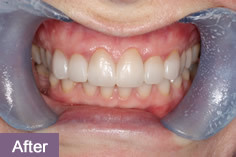 Lumineers are very thin laminates of porcelain applied to the surfaces of the front teeth without any preparation. This limits where they can be used since as no preparation is involved there can be a tendency for the tooth to become thicker and so look more bulky. There are several grades of porcelain available which largely determines the price. 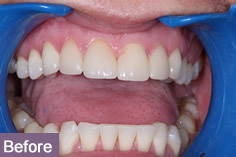 Typically veneers cost from £350 per tooth.